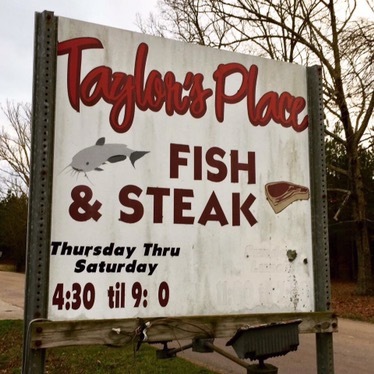 Taylor’s Fish and Steak House @ 538 North Glenfield Road, New Albany, MS. Friday night Seafood Buffet $18.99. 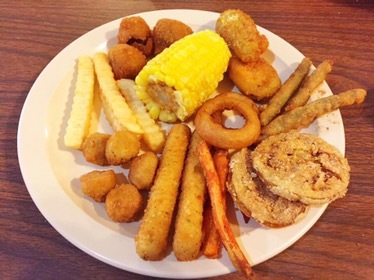 Open for country lunch buffet Tuesday- Friday 11:00M – 1:30pm, Thursday night country buffet 4:30pm – 8:30pm, Friday & Saturday night Seafood Buffet 4:30pm – 9:00pm. 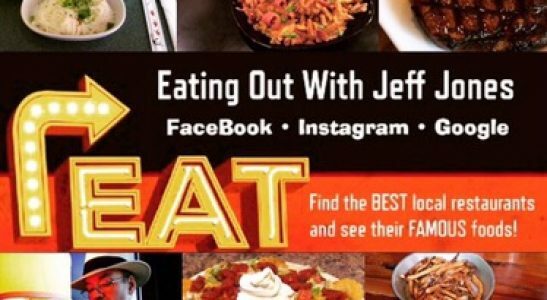 Plus, be sure to check out their Sunday lunch buffet! Taylor’s is one of those places that have been around for years and is synonymous with great food. If you’ve never been, you’ll probably need your GPS to get you there. It’s just minutes away from the heart of New Albany and near an industrial area. 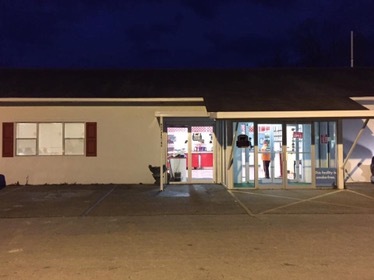 Other than the sign near the road, the building is unassuming, until you see the full parking lot, then you’ll definitely know you’ve reached your destination. 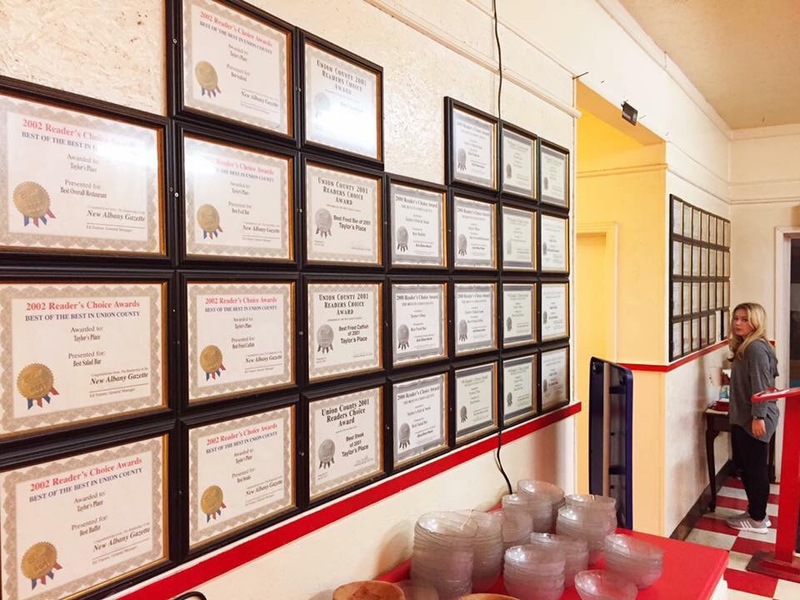 When entering the restaurant you’ll first notice all the local awards that cover the entire wall and signs showing they serve Mississippi raised catfish and Certified Angus beef. 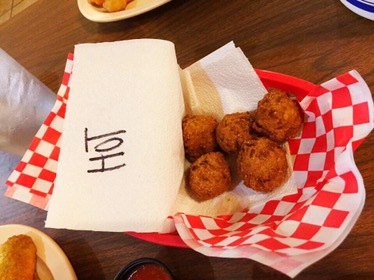 The friendly staff will help you find a table and menus, plus bring you a basket of regular or hot hushpuppies for good measure. 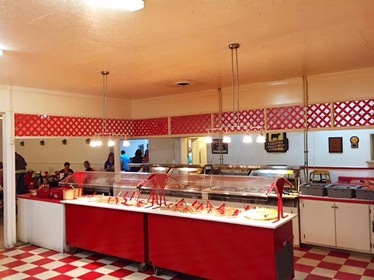 Although they have a full menu of tasty food to choose from, most folks are there for steak, catfish, or like me, the seafood buffet. You have about three different lines for the buffet, salad, seafood, and another for homemade desserts. 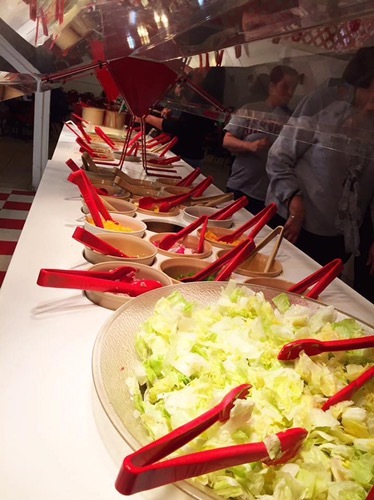 The salad bar was expansive and fully packed with fresh veggies. You could make a meal just on the salad like my daughter did. The seafood bar is massive. 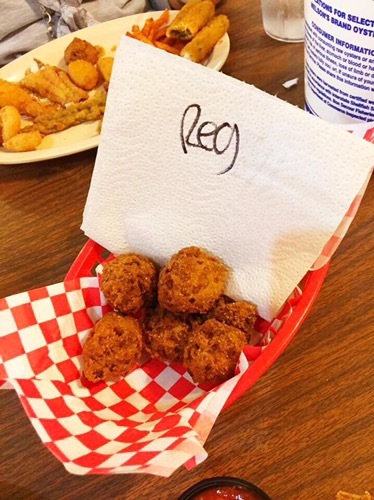 They have a wide variety of veggies including fried green beans, jalapeño poppers, and my favorite fried green tomatoes. 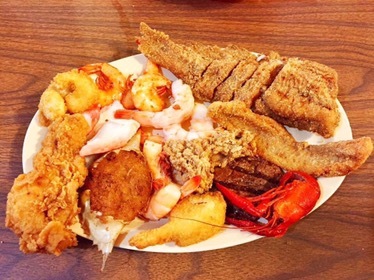 For the meat and shellfish, they have some mighty good whole and fillet catfish, shrimp served several ways, fried oysters, stuffed crabs, crawfish, and even steak! They have most everything other buffets have and then some! The deserts are awesome! 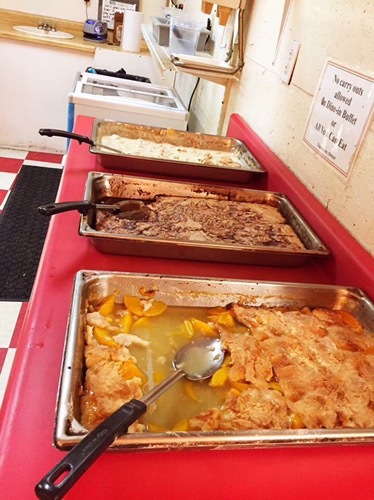 We had banana pudding, chocolate cobbler, and peach cobbler. I loved all three, but I’m partial to all things chocolate so their cobbler was just up my alley. Mix in the melted chocolate with the thick crust to soak it all up and I can call it a night. 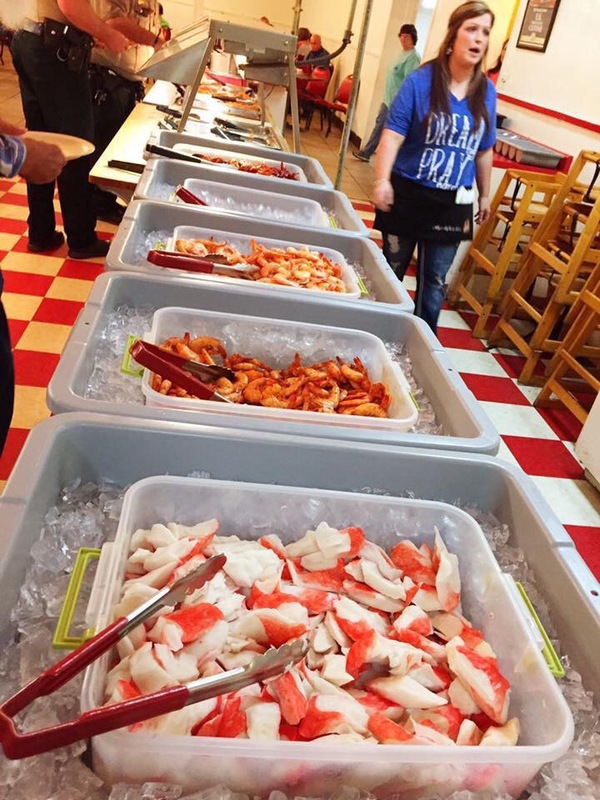 Folks, if you’ve never had Taylor’s Place seafood buffet, you should. 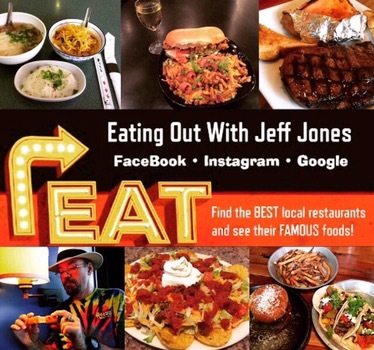 Once you do, you’ll be hooked! See y’all there!